Mutoh Valuejet 1617H Printer - Recognition Systems, INC. The ValueJet 1617H not only gives you the ability to print on rigid substrates, it also gives you the flexibility to print on roll media as well. Its dual function and multiple application design saves you valuable floor space and is ideal for printing packaging prototypes, trade show graphics, POP displays, indoor and outdoor signage, even vehicle wraps. The 1617H also comes with Mutoh’s VSM app for remote printer management, a half inch print height, faster speeds and ability to print white ink makes the VJ1617H a smart choice for all of your printing applications. 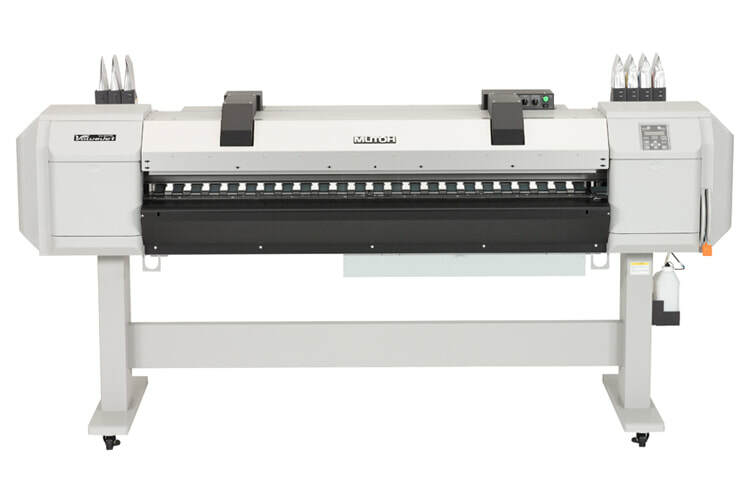 The ValueJet 1617H reaches board printing speeds up to 300 sqft an hour in production mode, but you also get a printer that you can use for both car wraps and rigid substrates with equal ease. Mutoh’s new ValueJet 1617H prints directly onto corrugated plastics, polystyrene, pvc, acrylic, polycarbonate, foam board, aluminum composite, banner material, vinyl, wall coverings and more. UV Alternative Bio-Based Ink. Not only does MP Ink give you high performance on rigid substrates, it also prints beautifully on roll surfaces with an exceptionally wide color gamut.